The Cebu cinnamon is a medium sized tree that can only be found on Cebu Island, the Philippines. An island that is only 4,944 km². The species is relatively new to science; it was described by A.J.G.H. Kostermans in 1986 after a specimen was brought back from the forest by an unknown collector. Cinnamons (a group of species belonging to the Lauraceae family) are highly prized for their aromatic bark and leaves, which are collected for culinary and medicinal purposes. For example, Cinnamomum camphora, C. parthenoxylon (DD) and C. glanduliferum are used to make camphor and essential oils for the perfume and pharmaceutical industries. But species of wild cinnamon are also utilised for these purposes. Like it’s relatives, the bark of the Cebu cinnamon is thought to have medicinal properties. It is used by local residents as remedy for stomach ache. The bark is either chewed directly or boiled with of water before drinking. 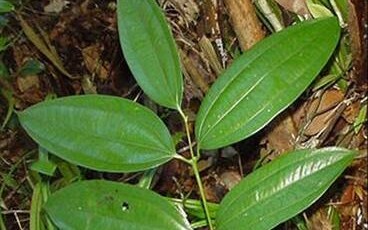 No other uses have yet been reported; however the leaves may be a potential source of spice for cooking, as with other closely related species in the Philippines. Loss of habitat of Cebu island is one of the greatest threats to the Cebu cinnamon due to increasing urbanisation and the declining forest cover as a result of agricultural encroachment. The practice of bark stripping for medicinal use also poses a threat to its survival, as over-exploitation of this resource may lead to infection, or even death. In 2004, the Global Trees Campaign supported Philippine NGOs and students to conduct a survey to inform a species conservation strategy. Prior to this project, only 57 individuals of Cebu cinnamon were known but, after surveys were completed, a further 691 individual trees were discovered. Three local organisations grew and replanted 1,100 seedlings and a further 100 wild-collected seedlings were grown on to a size that gave them a better chance of survival when they were re-planted in the forest. The Global Trees Campaign is now working closely with our partners to generate a comprehensive list of endemic cinnamons in the Philippines and prioritise species for action. The project will also work closely with cinnamon resource users to understand bark harvesting trends in order to eventually establish sustainable uses of the Cebu cinnamon. Bongo, J.V. and F. Seidenschwarz. 1990. The USC Botanical Collection in Cebu City Philippines. A brief history and description of the collection. The Philippine Scientist, 87:-98-113. Buot, I.E. Jr. 1995. Cinnamomum cebuense on Cebu Island: Conservation Concerns. The Philippine Scientist, 32:66-73.